Today’s guest post is written by our good friend Shelina Moreda (Facebook & Twitter), an FIM eRoadracing rider for Team Parker Brammo, an AMA Pro Harley Davidson Vance & Hines rider with Team Spyke’s H-D / She’z Racing, and the first female to have raced a motorcycle at the famous Indianapolis Motor Speedway. 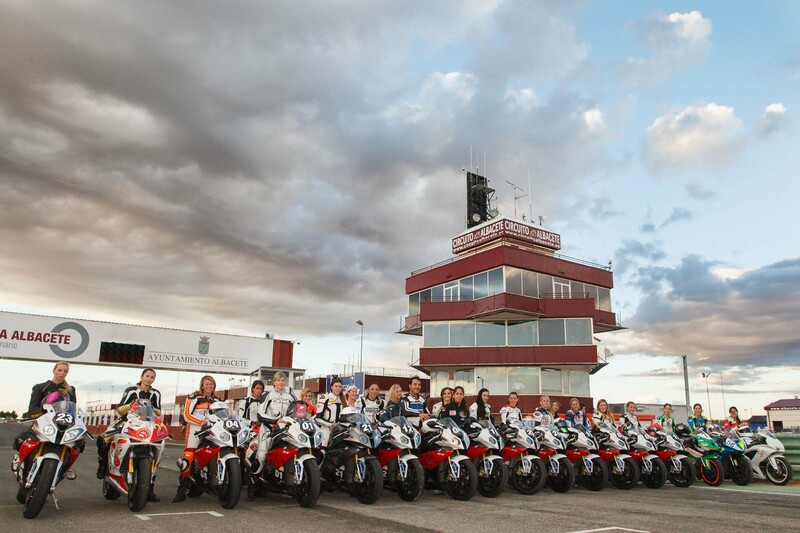 The first ever FIM Women’s Road Racing Training Camp in Albacete, Spain was better than any of us could have hoped for. The camp sold out, with 24 girls from 10 different countries in attendance. 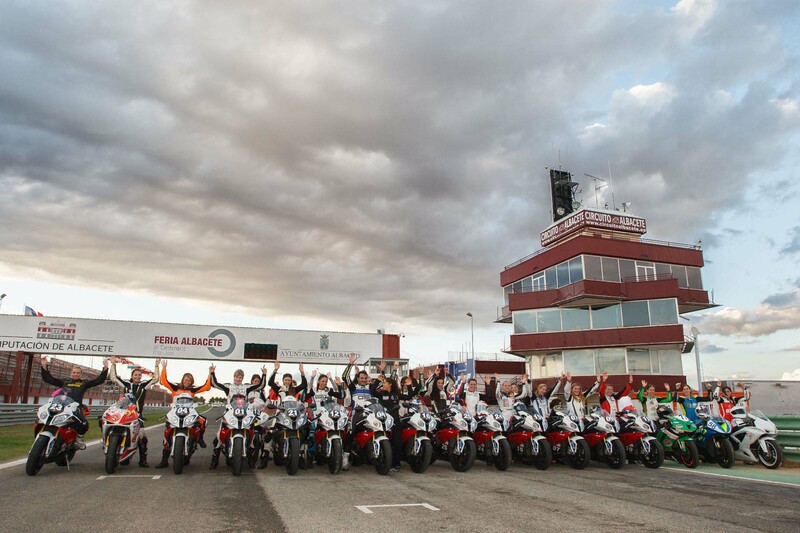 The Women in Motorcycling Commission organized this camp as one part of their larger goal of promoting women in all motorsports, and I was honored to be asked to instruct at this camp. 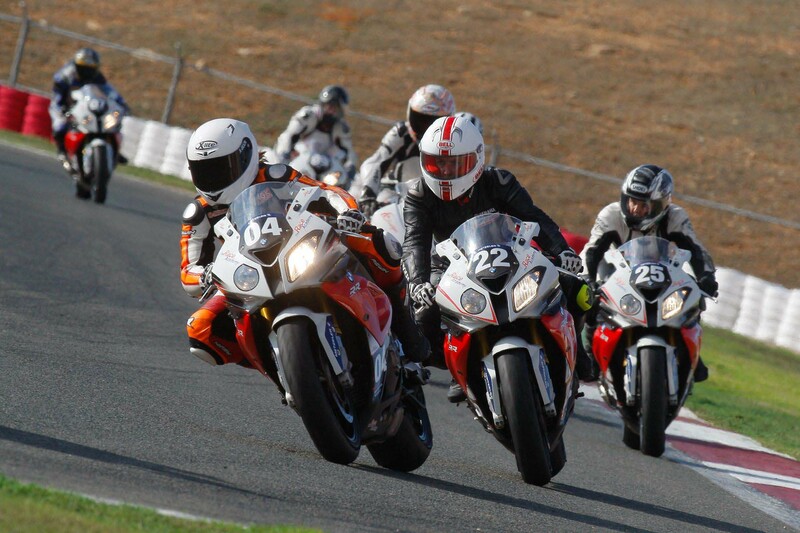 My fellow teachers include Mr. Ismael Bonilla from Spain – former Grand Prix rider in the 250cc class from 1996 until 2001, as well as guest instructor Melissa Paris, of AMA Pro Daytona SportBike road racing fame — an athlete many female riders look up to. 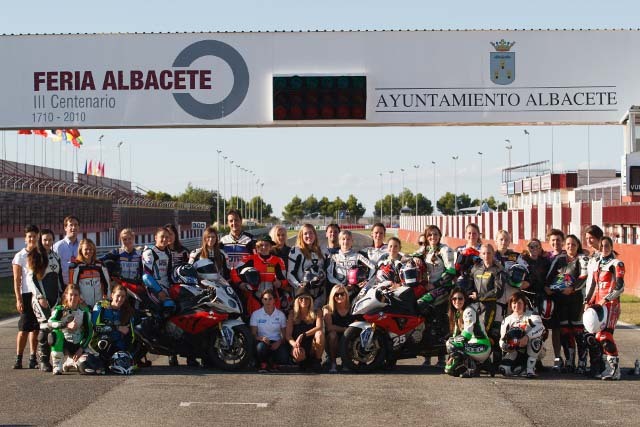 The goal of the camp was to give female riders from all over the world the opportunity to train with high-spec motorcycles and professional coaches on a major racing circuit, and to give them the tools to make them better riders. The FIM hit it out of the ballpark. 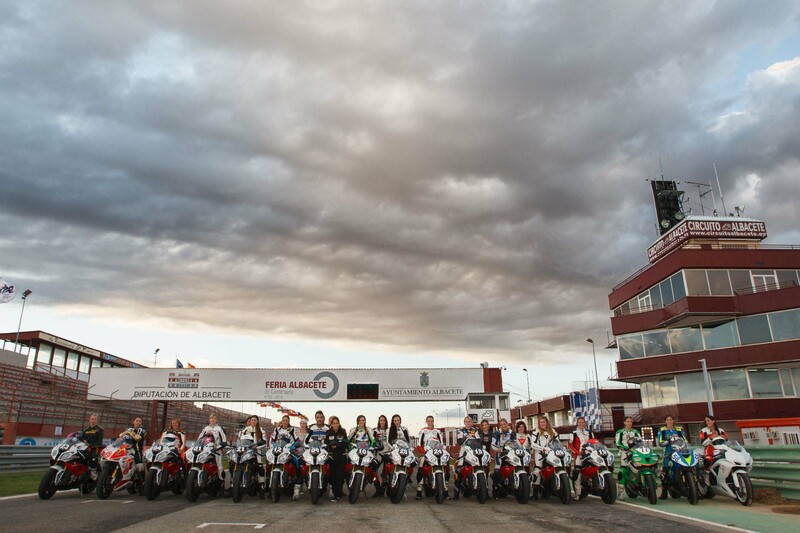 When Circuito de Albacete and BMW Motorrad caught wind of the camp, they stepped right up to offer support. 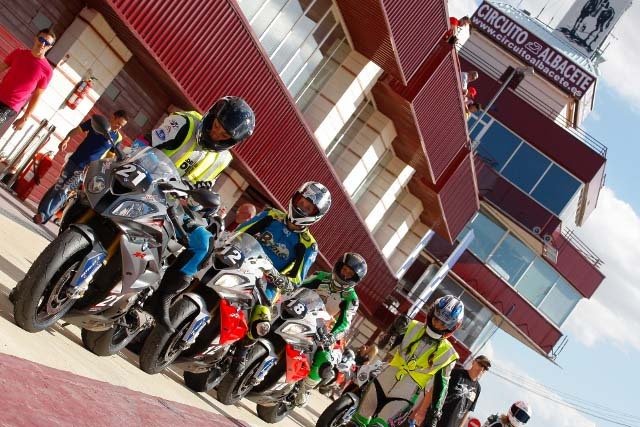 The Circuito de Albacete provided us with a venue and a prime weekend during the FIM European Road Racing Championship races. 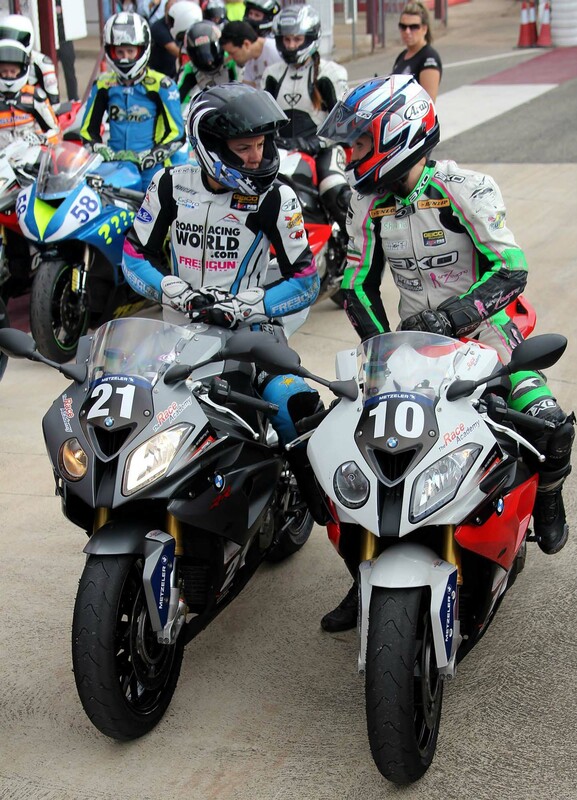 Since girls would be flying in from around the globe, we would need bikes, and BMW Motorrad also helped out immensely in this regard. 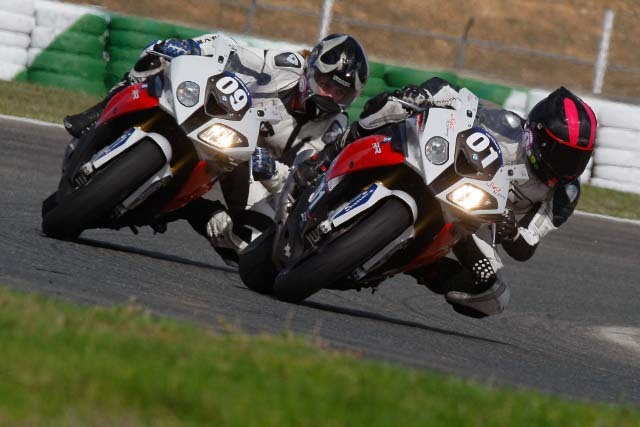 Providing the camp with an 18-bike fleet of BMW S1000RR superbikes, as well as two trained BMW mechanics, we had all our needs taken care of. All of the standard school curriculum applied; we did warm-ups, body-position talks, went over braking technique, did no-brakes drills, and race starts drills, all to help the girls improve their skills as racers. For me, no-brakes drills sounded a bit scary, and it is scary at first. We went around the whole track in groups, and could not touch our brakes unless we needed to for safety. 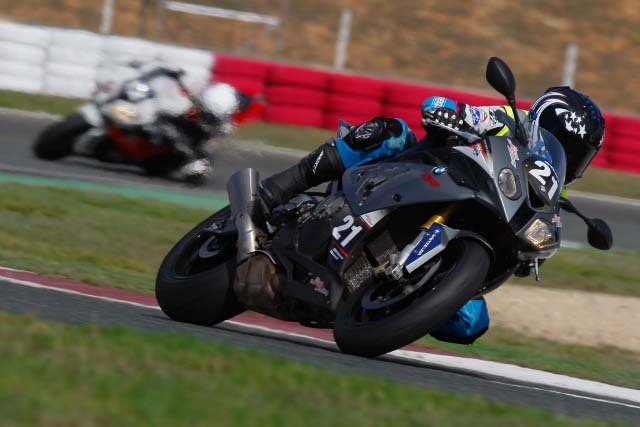 It taught us we could use less brakes going into corners, that turning in actually helps slow you down on its own, and that we can use more of the track, which helps us carry more corner-speed. For the starts drill, I held the green flag and three at a time, the girls did mock-race starts. 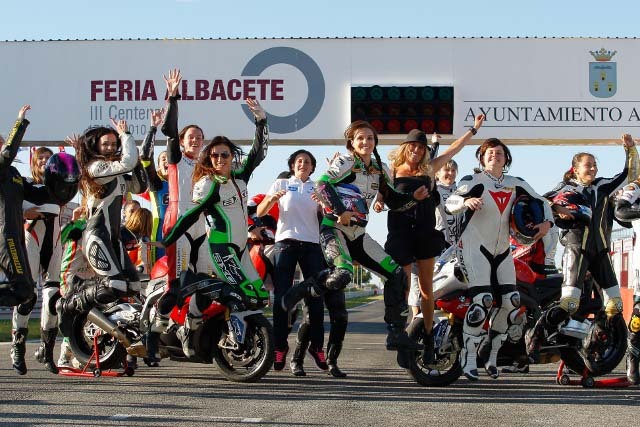 It was great to see the girls get a little competitive with the starts, show that they were learning the feel of the bikes, and improve upon this important part of a racecraft. Beyond what training camps normally offer, this camp also focused on other important aspects of racing that are often overlooked: we held seminars on sponsorship, racing as a career, and media and marketing. 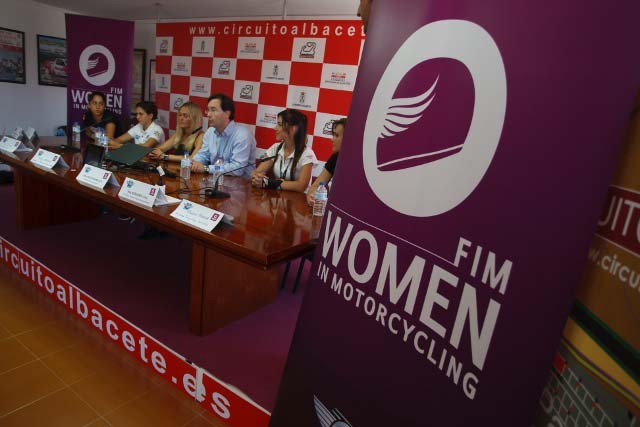 There were highly accomplished female roadracers as guest speakers to share personal experiences on how to obtain sponsorship and make sponsors proud to be a part of your racing program. They shared with us how to interact with the press, social networking, and tackling the intimidating task of putting yourself out there. We talked about things like how important it is to look professional, and to take the time to talk to your fans and people who support you. 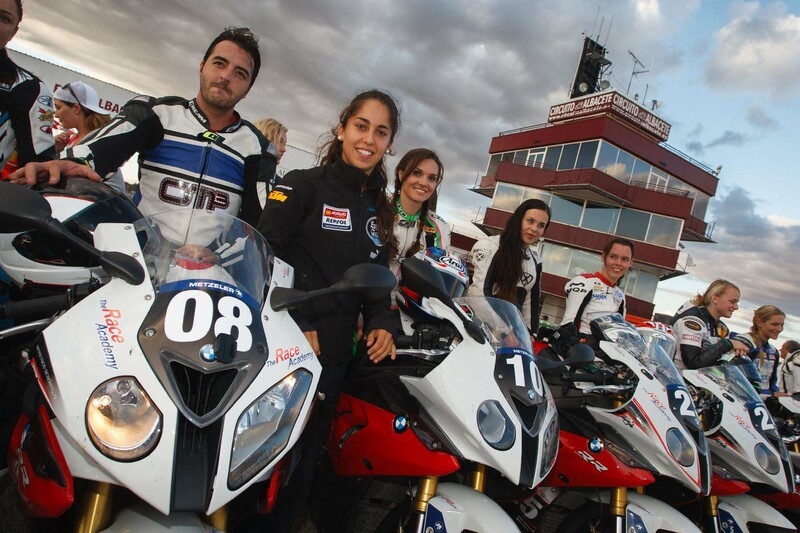 We were lucky to get some inspirational tips and advice from Ana Carrasco, Maria Herrera, Katja Poensgen, and Maria Costello, ladies who have raced in Moto3 and at the Isle of Man TT, and have qualified and raced against the guys in world-level competition. Before the camp, none of us girls were 100% sure what to expect… I mean, let’s be honest, gathering that many competitive females in one small space? It could be catty, and dramatic…However, it was anything but. It was competitive and supportive, as everyone was eager to learn and to go faster. Friends were made and skills were shared. Everyone was having fun! By Day One, we knew we had to step up the pace and the challenge. We incorporated more drills and a workout that the girls could do while traveling for racing. By Day Two, we were already talking about having a second camp, and by Day Three, we were talking about a Women’s Cup, a real, world-level race. I personally felt a huge bond between all the girls in attendance. We talked about how much fun we had, and how much we would miss each other. At our “graduation” type ceremony at the end of the camp, each of the girls was presented with a certificate of completion and a pin, and I was presented with a couple of pages of autographs and notes from all of the girls, two papers that mean the world to me. These girls really loved being a part of the camp, loved their learning experience, it was a success, and a seriously worthwhile experience for all of us. “We knew that the girls are fast but we had no idea that they could do so extremely well. 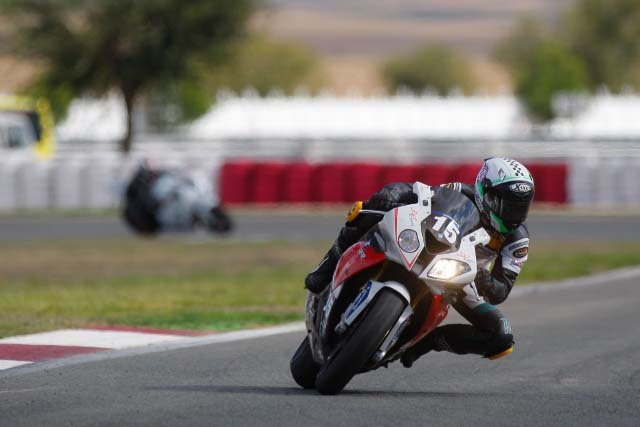 Ismael, who in 2010 was the first rider in the world to win an official race with a BMW S1000RR at this very same track, highlighted that he really had to push hard to stay at the pace of the fastest riders”, said Nita Korhonen, FIM Women In Motorcycling Commission Director. 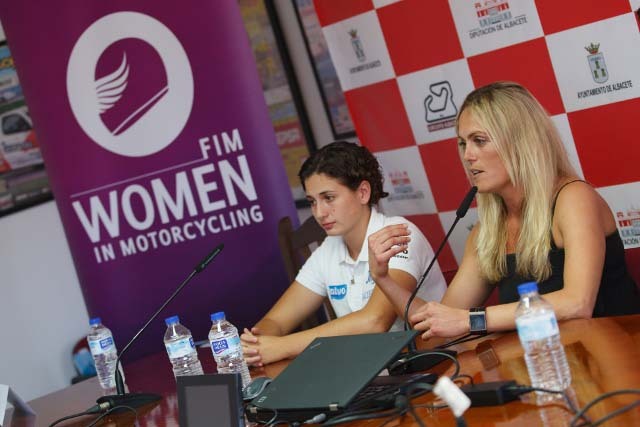 “Now we know that we are on the right track in our efforts to bring more women into racing and that we can also fascinate spectators as these girls showed that they can really race and go fast. The FIM accomplished their goals and then some. I don’t think even they knew the waves they would cause. 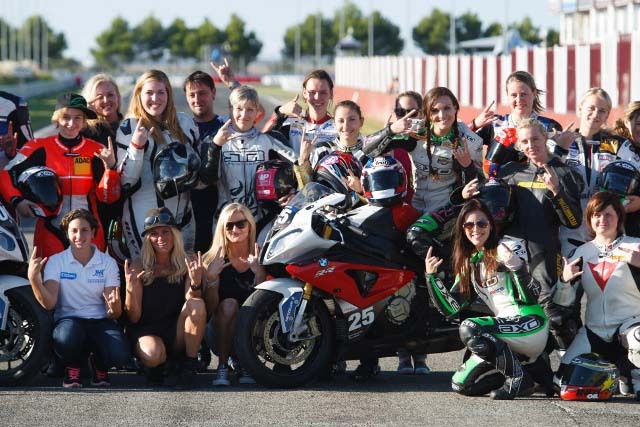 This entire group of girls is passing around photos on Facebook, emailing each other, planning to visit other countries to race each others’ motorcycles and series, and looking forward to the next FIM Women’s event. This is a huge door opened for all of us as racers, a worldwide networking of female competitors, and a seed planted for opportunities. All of us girls are proud to be a part of its beginning. Alisha Abdullah (India), Peggy Appelmans (Netherlands), Avalon Biddle (New Zealand), Kimberly Brouwers (Netherlands), Elena Diez Lopez (Spain), Anna-Maria Eriksson (Finland), Natalia Florek (Poland), Sheila Garcia Agudo (Spain), Loumari Grobler (South Africa), Monika Jaworska (Poland), Cristina Juarranz Chamarro (Spain), Anastassia Kovalenko (Estonia), Laura Martinez Hernandez (Spain), Clarissa Miebach (Germany), Janine Mitchell (South Africa), Shelina Moreda (USA), Ricarda Louisa Neubauer (Germany), Estelle Noclain (France), Melissa Paris (USA), Jasmin Sarjos (Finland), Celina Scheffler (Germany), Nadieh Schoots (Netherlands), Andrea Sibaja Moreno (Spain), Alina Cristina Udrescu (Romania), Nicole Van Aswegen (South Africa), Jolanda Westrenen (Netherlands).